"Best custom apparel all in one e-commerce solution "
With Deconetwork, building a custom apparel e-commerce website is a breeze. I have been with DecoNetwork since 2010 and I found it the best Web-to-Print solution for print shops who sell custom t-shirts, signage and other promotional products. Its Business hub has all the functionalities which a print shop owner requires from getting the print-ready artworks to sending the custom quotes to clients. Deconetwork team is continuously working on keeping themselves acquainted with latest trends and technologies on the web, with the upcoming update to Deco 8, their system will become the most powerful solution for printing industry as they introduce mobile responsive online designer & drag and drop widgets to easily customise the website pages and many orther features. It is the most difficult question to answer as deconetwork fulfils all my requirements as a custom apparel printer. It would be best if it can also be integrated with other e-commerce platforms like Magento or WooCommerce. "DecoNetwork is the complete solution for Online Printing Business"
Before using DecoNetwork we tried other similar online designers plugins for Magento and Prestashop but we were always busy in configuring the products, software setup, hosting, troubleshooting etc. and wasting lot of time on making it live rather than giving time to our main printing business. But now with DecoNetwork, we have fewer worries about the website, third-party plugins, hosting, troubleshooting, etc and we are more productive and successful in running our business. give it a try. you would be happy. I would say Business Hub is the most powerful feature of DecoNetwork. Its easy to use and have lot of features specifically designed for apparel and decoration industry. It also gives seamless production management workflow from quote to shipping. We have tried almost all similar solutions but found DecoNetwork the complete solution for our needs. The next best thing in DecoNetwork is their support which is quick and always available to help. What Apparel Business Management and ERP solution do you use? "DecoNetwork Is A Complete Solution For Decorated Apparel Business"
It completely streamlines your business. The initial draw is to be online, but it's MUCH more than that. DecoNetwork provides you with a backend they call the Hub. From there you manage orders from all your stores, even if it just operate one. I operate 2 primary sites and a few smaller ones. It allows you to manage everything you need (off the top of my head): payment methods (credit cards, PayPal, direct wire, custom terms, N30, whatever you want), Statements, supplier product lines, EDI purchasing, customer discounts, customer store assignments, production management steps (purchasing, receiving, art approval, production, shipping), email notifications to customers for steps I mentioned, all history is recorded for you & customer to see (orders, quotes, notes, emails, confirmations, tracking, etc), private internal notes for order/quotes, customer statements, numerous notification options (payment requests, general emails, etc), customization of all system emails & order/quote/art approval templates, production operator assignments, multiple user rights (assign roles: admin, sales, accounting, production, art, etc), production overview (see all orders at a glance and all the status of each dept), Live shipping Methods (UPS, FedEx, USPS), custom shipping methods, complete supplier catalogs with correct data (skus, weights, costs - Alpha, SanMar, etc), Assign profit margin based on supplier cost, shipping based on true product weights, assign print areas to ALL products in single setting or individually, Smart Select rules automatically assign what decorating methods are allowed on products (think about one setting that removes DTG from all poly blends or buttons, numerous criteria), setup all your decorating price tables to be added to blank products (for each method, screen, dtg, embroidery, sublimation, transfer, rhinestone), customize color pallet & fonts avail for each method, customize product defaults (lets you change all settings for different set of products), product defaults can be overridden on individual products, abandoned cart retrieval (followup with email, convert to quote or order), quotes convert to order (by you or customer, easy check out. Web design is completely customizable and now with the latest version 8, it's truly a drag & drop page designer. Completely responsive on all devices, including the designer. It's superior to anything else available. The designer was great and just became unbeatable. I don't like to see inaccurate reviews. I've been using DecoNetwork for 8 years. The only issue I find HAD merit was web design. The templates WERE stale. BUT they could be made responsive & beautiful. I did it. Others did it. If you can't do it, hire someone - that's business. But that argument is no longer relevant - DecoNetwork site design is SUPERB. Look at the major competitors first, like Inksoft, then get a demo of DecoNetwork. There is no comparison. I pretty much said it above, but in a nutshell: Standardized all my pricing, production settings, payment methods, shipping methods for extremely quick, consistent & accurate processing of quotes & orders. I can process the workload of what literally required 4 employees. I've been in business for 30 years, with 8 automatics, and dozens of employees - I cannot imagine surviving or keeping my sanity without it. "Excellent Developers and EXCELLENT customer service!" I love how easy the software is to use and the customer service is through the roof. When ever we call and have questions or concerns they are always there to answer them. If they don't answer the call, they always call back within a few hours. Just a small detail, sometimes the products are hard to sort in the back end and the colors aren't in alphabetical order. We had looked at several companies before choosing DecoNetwork. Their customer service is what sold us. They are absolutely wonderful. Everyone is extremely helpful and knowledgeable. If the person you are speaking to don't know the answer, they find someone who does. They also always follow up. Just an all around outstanding company. We have a web store where people can design and purchase their own shirts. They are our store, so they are basically our business. "A Fantastic All in One Online Store Solution!" Easy to use, and jam packed with features to help you get your business off the ground. From Sales all the way to Production management, the DecoNetwork platform has simplified the process of managing your online business. Get up running in no time. Oh and did I tell you how great their support network is? Well, it's second to none! Hmmm, hard question. The DecoNetwork platform has come a long way since the early days of inception and it just gets better and better with every new release. Updates are FREE by the way. Currently the platform doesn't offer Responsive templates but I believe this will be available in the new release due out any day now. Ask for a Free Trial to get you Started! and see the benefits it'll bring to your business! With the DecoNetwork platform, our team was able to streamline the production process with the Deconetwork Business Hub. A streamlined process means fast throughput and efficiency with our online store management and production. Why use outdated and Jerry rigged software when the Deconetwork can handle everything for you. It's a Business in a Box! made just for you! The design tool allows potential customers to be creative on my website without me having to talk to them or try to figure out what they want. Great for embroidery. Their plans are cheaper than InkSoft and you get the same thing. The online stores are difficult to set up. I would not recommend using this for group orders (which tend to be a pain anyway). The sales person I had was a bit strange but other than that, this does what I bought it for. Providing highly personalized products for small clients online. It takes out the hassle of figuring out what people want to make. "Don't use DecoNetwork unless you want to build a website"
The idea of deconetwork. I wish they could just implement some responsive website templates. I really dislike the fact that deconetwork uses a demo site that is relatively responsive on mobile, but all of their templates require massive overhauls to bring into this decade. Oh, and guess what, once you edit the html or css, they no longer support their templates. They clearly don't offer a free trial because they know they will get lots of you to sign up for one month thinking you can get up and running quickly with a professional presence for your company. They know that isn't possible, so they get what they can while they can. If you can handle massive coding or think your customers don't mind zooming and moving all over your site to read it on their mobile devices give them your money. But be warned, they won't give it back when they don't deliver what they promise in their advertising. Don't use deconetwork unless you are skilled in web development or are willing to pay for it. I never launched this project because the website is unsatisfactory, and we chose not to represent ourselves with this subpar product. "I used deconetwork to sell custom t-shirts online as a direct to garment printing company." It offers quick and relatively cheap entry into e-commerce custom t-shirt design with an online t-shirt design tool for your customers. While the upfront cost of setting up an e-commerce business with deconetwork is relatively small, you pay for it in the long run due to limited ability to customize the site to your liking. In my opinion, they are more interested in selling their custom design services to you than they are interested in helping you sell t-shirts. 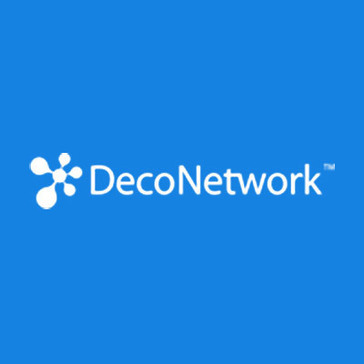 It seems to me that deconetwork is made for t-shirt decorators who already have an existing brick and mortar location who wishes to dabble in e-commerce. Despite the claims that you have full access to the html and css, you have to spend a large amount of time to override the existing framework and it is often impossible to configure the site in a way that optimizes the user experience. I found it impossible to configure the site in a way that I found acceptable for my customers. If I had been willing to pay for their design services, I'm sure that they would have been able to configure it the way I wanted. The main benefit that I saw was the low cost of entry. I was able to set up a fully functional e-commerce site in a relatively short period of time. The online design tool was html5 based rather than flash based as many of their competitors. This made it possible for mobile users to try the designer on their phone if they wanted. "Deconetwork was not easy to use." I like it best that it is easy to set up for purchasing garments for customers. I dislike a lot of things about it. One thing being that they do not offer website coding anymore, another being that all of your "stores" you set up are linked somehow. We are solving the simplicity of customers buying our product. I have yet to realize any benefits. * We monitor all deconetwork reviews to prevent fraudulent reviews and keep review quality high. We do not post reviews by company employees or direct competitors. Validated reviews require the user to submit a screenshot of the product containing their user ID, in order to verify a user is an actual user of the product. Hi there! Are you looking to implement a solution like deconetwork?